A contemporary accent for your home, this upholstered chair offers a quick and easy way to switch up the seating and style of a room. Shaped by a gently arched back and flare tapered arms, this piece has a cute and compact style that everyone will enjoy. With the addition of tapered wood legs and welt cord trim, this chair's fresh look is complete, while its sinuous springs and high-density foam cushions provide lasting comfort. 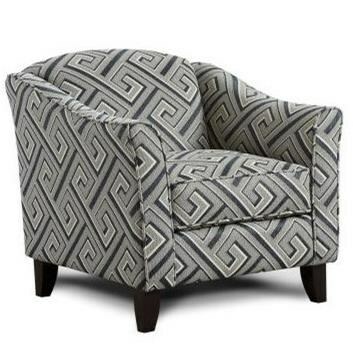 The 452 Contemporary Accent Chair with Tapered Legs by Fusion Furniture at Royal Furniture in the Memphis, Nashville, Jackson, Birmingham area. Product availability may vary. Contact us for the most current availability on this product. Browse other items in the 452 collection from Royal Furniture in the Memphis, Nashville, Jackson, Birmingham area.